ikipedia defines pied-à-terre (French for “foot on the ground”) as “a small living unit usually located in a large city some distance away from an individual’s primary residence. 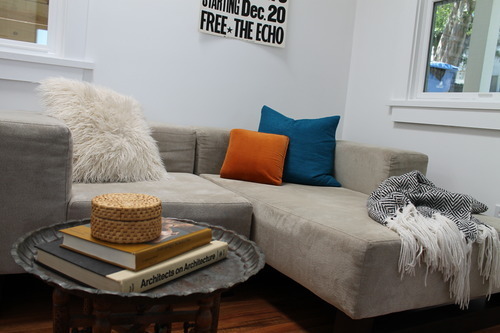 It may be an apartment or condominium.” The Echo Park bungalow we just styled is a very small space — a mere 500 square feet, with 150 square feet of deck space. 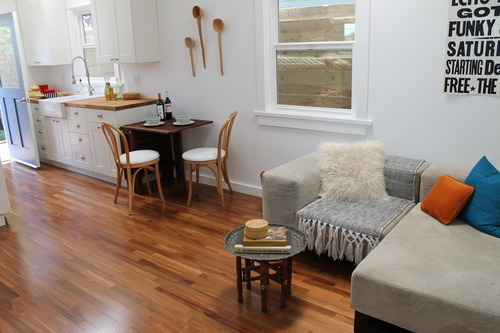 But we were able to pack a lot of style into each of those precious square feet by using right-sized furniture with modular options. 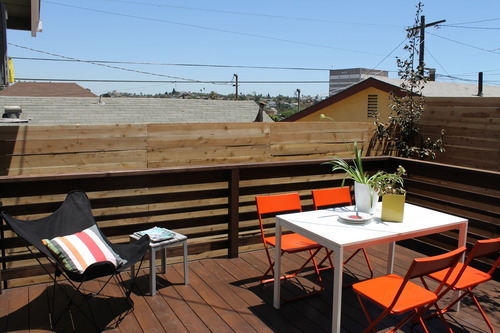 Steps from L.A.’s popular Taco Zone truck and Mohawk Bend, this Echo Park home offers a walking-friendly location and vintage original charm — in a cuter-than-cute package. 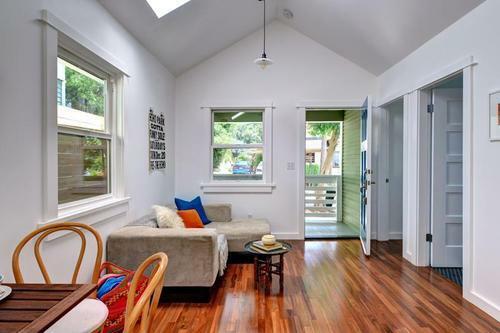 In styling this Craftsman cottage — inventively re-imagined by Matt Manner’s Extraordinary Real Estate (ERE) team — we used warm orange as a tonally repeated color accented with bright pops of white, teal, blue, red and yellow. The clean white walls lit by skylights offered a multitude of options for bold and earth tones alike. Narrow plank hardwood floors, vaulted ceilings with skylights and industrial hanging pendant lights create a sense of space in the diminutive living area. We used two parts of a modular west elm sectional, a brass tray table with an inlaid wood base, and two vintage bentwood chairs pulled up to a table that can be extended in length to seat four. A bit of fencing is visible through the window. 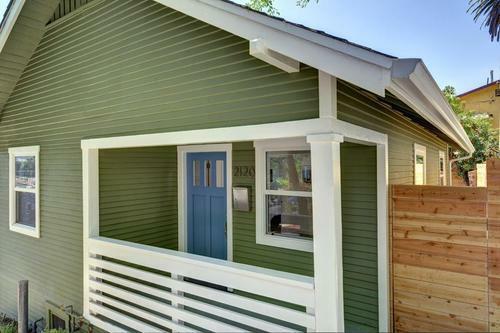 Its characteristic horizontal planking is a sure sign that a property has been flipped by an Eastside L.A. flipster. A colorful tote basket we found at a thrift shop in Garvanza holds a Mexican blanket. A few interesting cocktail table books and a basket on the tray table top. 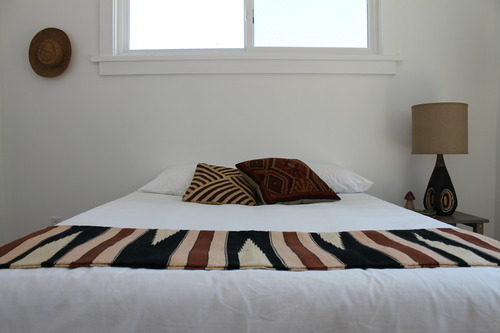 The chevron throw was also a vintage find. 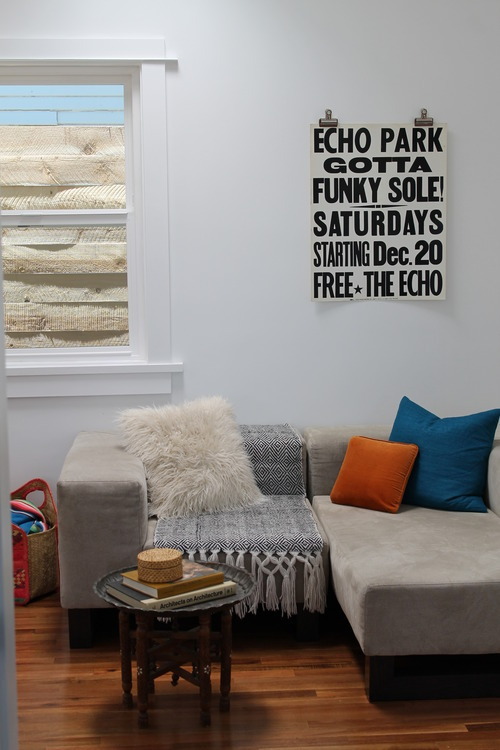 The Echo poster was a natural choice for statement art in the living area. 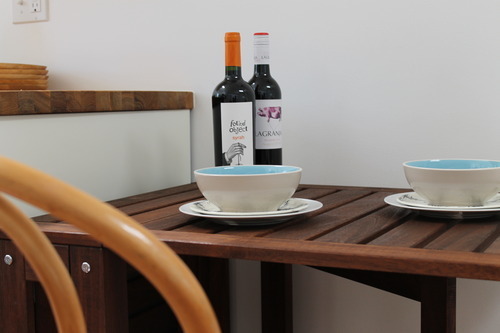 The dining area’s table can be oriented to the wall in a perpendicular fashion and fully extended to seat as many as six on a whim for a dinner party. Folded back up and tucked into the corner, it’s breakfast for one or appetizers for two. The hand-carved vintage wooden spoons we hung on the wall were sourced at Pepe’s in Echo Park. We shop local! A quick trip to Trader Joe’s turned up a couple of awesome bottles of wine. What better wine label for us than one called Found Object? 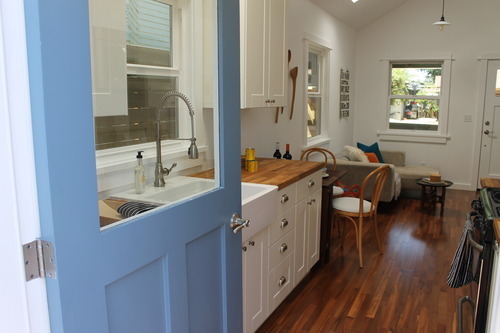 Shaker style white cabinets and butcher block counter tops in the kitchen. 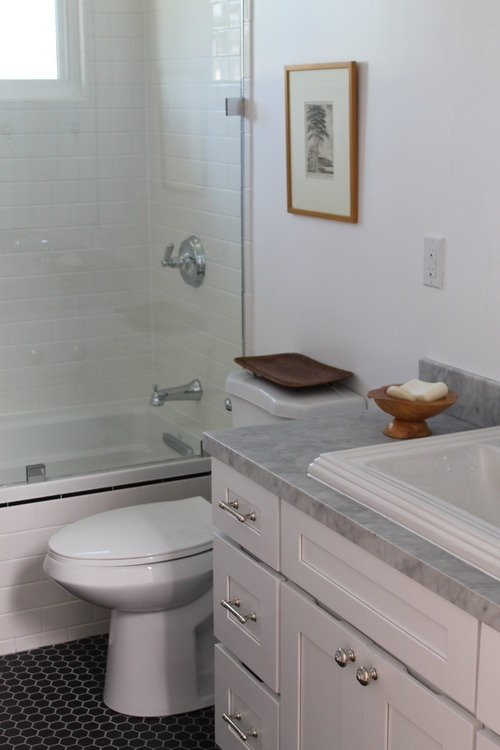 Brushed chrome bin pull hardware complements the Craftsman style of the home. 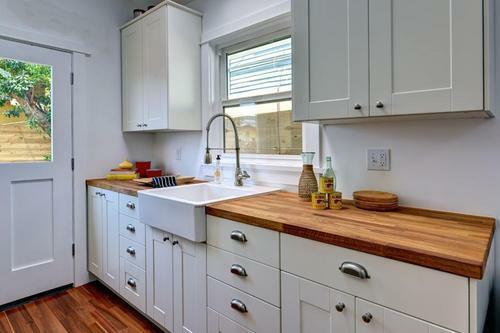 An apron-front deep farm sink is both practical and beautiful. 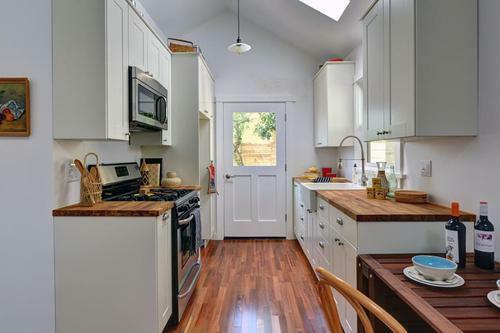 A vaulted ceiling and tons of natural light in the kitchen. Tall cabinets with plenty of space above afforded us the opportunity to use our vintage aluminum canisters, rattan accents and baskets. 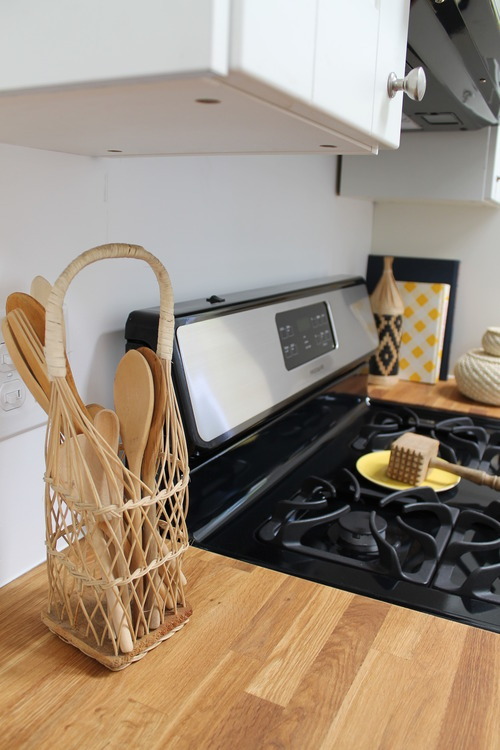 Wooden spoons in a wine holder basket and other textural kitchen accessories. 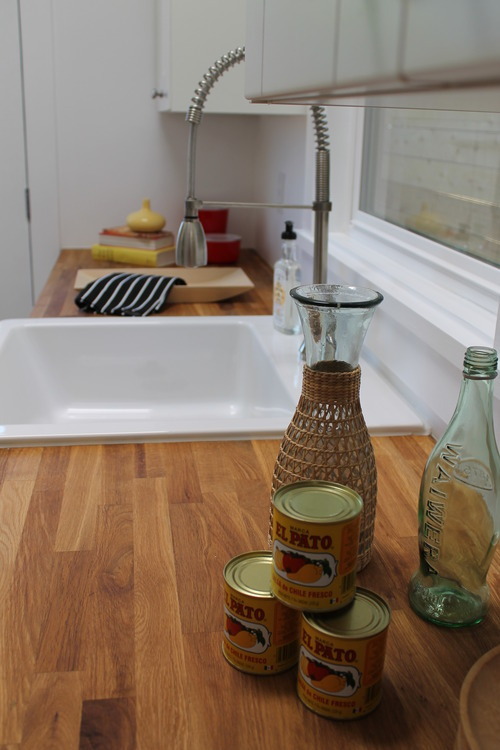 Yellows and reds in the El Pato cans inspired a clean, bright palette of colors in the kitchen. Cookbooks in the same tones and a snappy B&W tea towel pop against the butcher block countertops. We’re huge fans of tall industrial faucets for their pot-filling abilities. The back door opens right off the kitchen, inviting indoor-outdoor living. Its light blue is a signature shade which appears in all ERE homes. 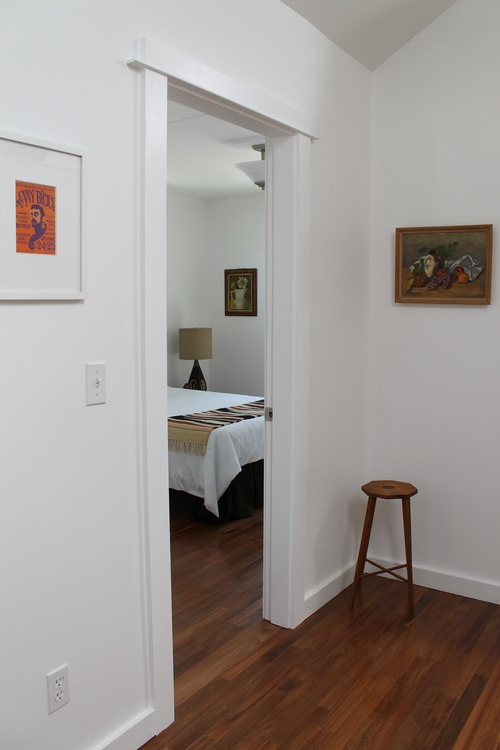 A peek inside the bedroom reveals a Mexican blanket and a vintage Mid Century modern lamp and oil painting. The white-framed Lenny Bruce handbill is a 1960s Fillmore West original. 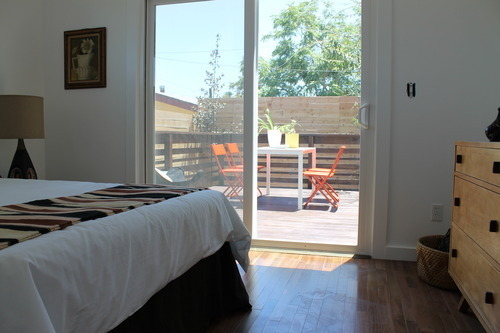 The bedroom opens to a large wood deck. 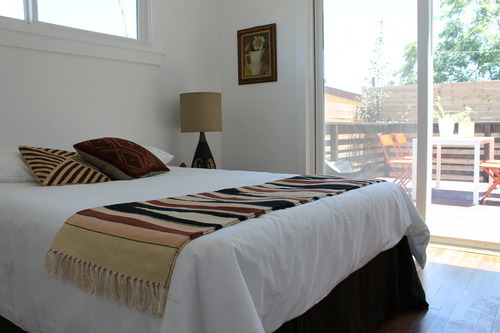 We accented simple white bedding with earth tones, using a Mexican blanket, kilim and rattan pillows. 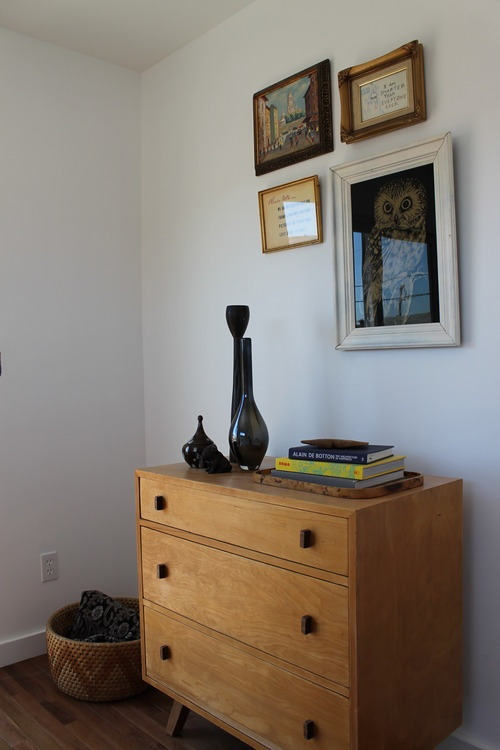 A Mid Century Modern dresser to the right, and a peek at the deck. We found the dresser at Pepe’s Furniture on Sunset, and above it added a frame cluster of original art by Rachel Moore mixed with a few eccentric thrifted pieces. 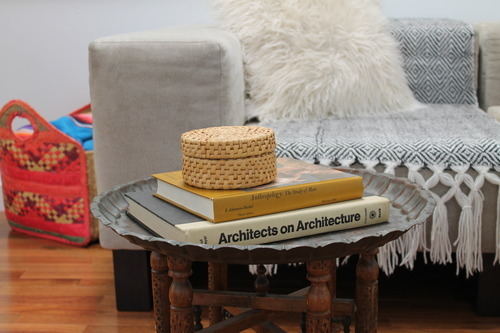 We love how the strong geometric pattern on the woven rattan pillow complements the blanket. 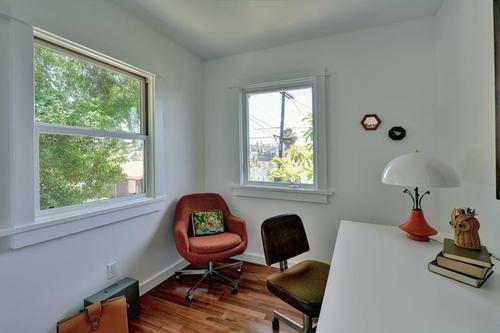 We outfitted the tiny office with an IKEA Melltorp table as a desk, paired with a vintage desk chair. The vintage orange lamp was another Pepe’s find. 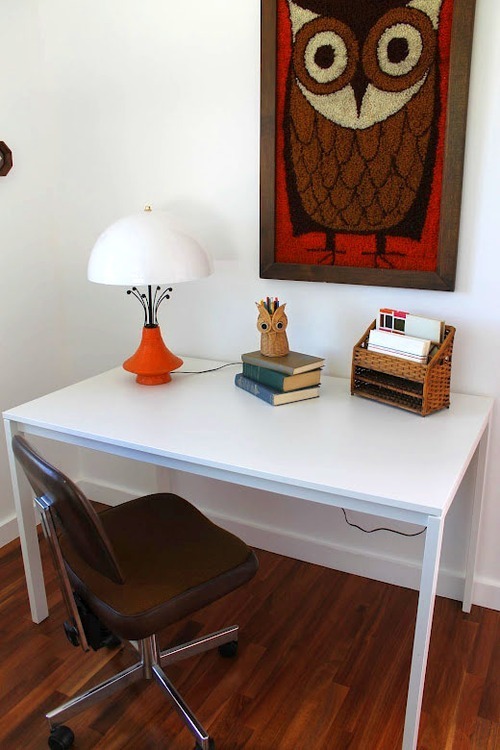 The cute leopard cub pillow is the perfect scale for the small Mid Century orange swivel chair. Rachel found the needlepoint owl at our favorite local thrift store (no, we’re not revealing it just yet, people). 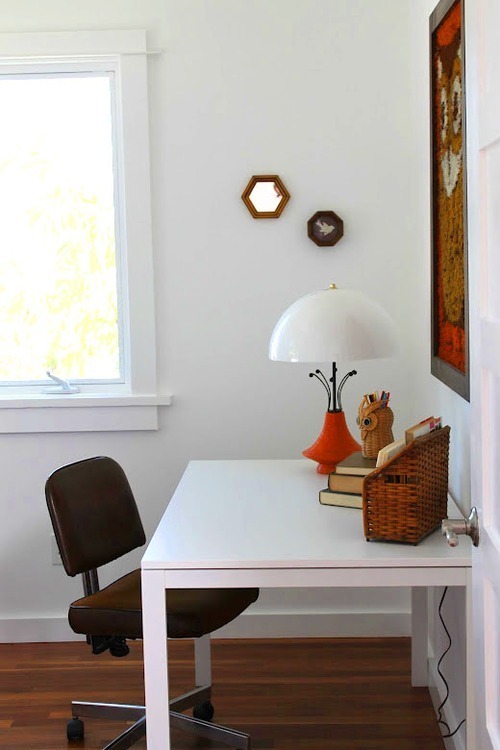 We love how the lamp looks kind of like a bug. 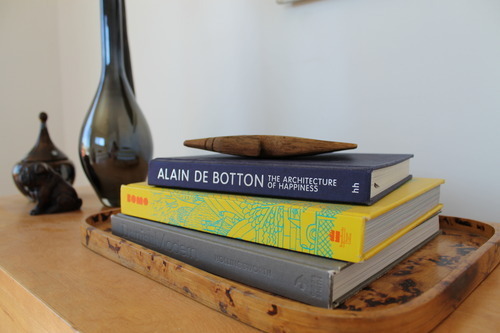 A couple of vintage rattan desk accessories, including an owl pencil holder, are all you need. 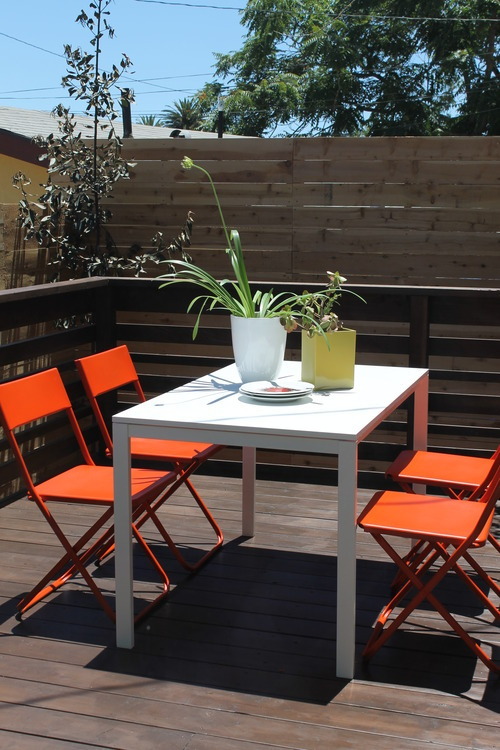 Believe it or not, those are IKEA’s Jeff chairs on the deck painted with Rustoleum’s Fire Orange (new color!) paired with another Melltorp (we love its versatility). Desert plants in simple planters complete the scene. We got a great deal on the butterfly chair (all we had to do was paint its original white frame black). Now this is a party-ready urban backyard! We carried the orange and white theme into the bathroom with big bath towels from IKEA in a muted orange. A handmade wooden soap dish and a 1970s etching in the bath.